← How to use PDF Repair to Fix Corrupt PDF Documents? 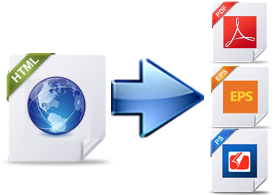 Convert HTML to PDF, PS and EPS. Convert HTML to JPEG, TIFF, PNG, TGA, PS, EPS, PCX, BMP, and GIF image. Convert HTML to Word, Excel, CSV, RTF and TXT. Set password to encrypt and protect created PDF files. Add page header to created PDF. Option to remove hyperlinks in PDF. Option to convert HTML table to PDF table. Option to set PDF page layouts. Option to set PDF title. Option to set image size, color depth and resolution. Option to dither when reduce color depth. Multiple options to compress TIFF image. Option to set JPEG image quality. Option to trim image margins. Option to rotate created image. Option to add end-of-line in created textual files. This entry was posted in HTML & PDF to ePub Converter, HTML Converter (htmltools) and tagged html to any, html to eps, html to excel, HTML to image, HTML to PDF, html to ps, html to word. Bookmark the permalink.